Posted on December 7, 2010 by Jill B. The lines between work and play are often blurred for digital storage. For example, it’s an all too common sight on your USB flash drives to have the latest rock song you downloaded listed in a file folder right alongside your business presentation. The Quirky Split Stick is a unique flash drive solution that proves opposites attract. It keeps professional and personal separate, while streamlining portability so that you’ll never lose track of either one. The Quirky Split Stick is a USB thumb drive that is double sided. The single 8GB memory stick has two retractable USB drives, with one metal USB 2.0 connector at each end. The sturdy aluminum drive is protected by a soft and colorful rubber casing that’s currently made in black, pink or orange. The USB stick has iconic designs that are custom printed on each end of the device to help you distinguish the function of each 4GB drive from the other. You’ll get USB design choices such as: love and hate, plus and minus, dots and solid dots, home and work or look and lock. For consumers who rely the most on speed and performance, you should be aware that flash drives are not Quirky’s product specialty. They sell innovative novelty items for home, travel and the outdoors (a bobbling toothbrush, anyone?). Consequently, you’re likely paying more for the idea and convenience of a USB Split Stick than for the quality. While users applaud its design and multipurpose nature, others gripe that its speed or physical quality may have shortcomings (broken retractable sliders). According to a consumer that wrote one article, a Quirky representative said a batch of the initial drives were defective and were promptly replaced with slider buttons that function. It sounds as if the consumer opinion of the drive may be just as polarizing as the intended data functions. However, for innovation and appearance, we’re willing to give this dual flash drive the benefit of the doubt. Love it or hate it? Have you bought or had a chance to use a Quirky Split Stick? Whether you own it or not, talk to us about the device’s design versus performance. 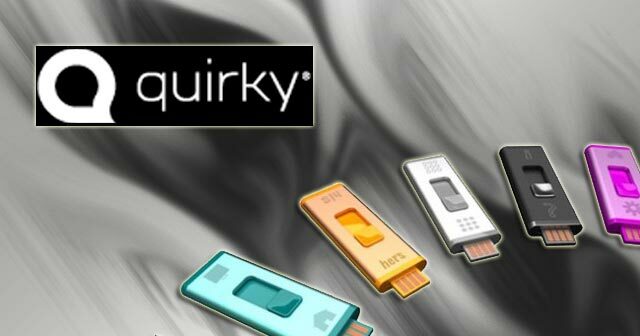 This entry was posted in Articles, Flash Drive, Quirky, USB Flash Drives and tagged Quirky, Quirky Split Stick, Quirky USB flash drive, Two In One USB Flash Drive, USB Split Stick, USB thumb drive. Bookmark the permalink.